Portada Donas, Susana. Un almanaque para ti 1972 = [A Calendar for 1972]. 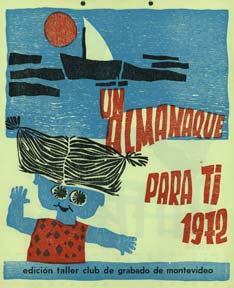 Un almanaque para ti 1972 = [A Calendar for 1972]. Editorial: Montevideo: Club de Grabado de Montevideo, Uruguay. Shipping Costs: For books within the US: Ground UPS $8 for first volume, $4 for each additional volume. Heavy volumes cost more. Prints and posters $20.00 for 1-3. Most foreign shipments by airmail are $17.00 up to 1 pound or $60.00 up to 2.2 kilos by courier. For all other shipments, please inquire. UPS shipments are insured for $100.00 automatically. Higher amounts available. If merchandise is damaged in transit, customer must save shipping container and file a claim with UPS or other carrier. Do not return merchandise without having first filed the claim and received a return authorization.